Do you feel that your eyes are getting strained and you need to have an eye check up? Eyes are very important and we need to take special care of our eyes. They are our windows to the world outside. Often we do not take care to check eyes and go on with blurred vision, aching eyes and many other eye problems. If you have some issues with your eyes, one thing that you can do to make your eyes healthy is to go for acupressure. Acupressure is an ancient therapy and it is used for treating a number of diseases. It is an alternative therapy in which pressure is applied manually to stimulate certain specific points in the body, along the lines of energy. It is based on the concept of life energy which flows through the meridians in the body. When an obstruction takes place in the meridians, you feel pain in these spots. It can also cause various illnesses. The pressure applied helps in clearing the blockages formed in these meridians as a result of reshuffling the accumulated energy. Acupressure is very useful for treating myopia or shortsightedness, cataract, presbyopia, color blindness, astigmatism, amblyopia, hypermetropia and so on. According to the ancients Chinese, our eyes are connected to various parts of your body like the neck, liver and the toes. Although using needles (acupuncture) is thought to be more effective, you can also use your fingertips and massage or Shiatsu (Japanese word which means ‘pressuring by finger). This is equally effective and easier to practice. You must be amazed to learn that there are acupressure points even around your nostrils. By massaging these acupressure points, you will get great relief from the nagging headaches that often irritate you. 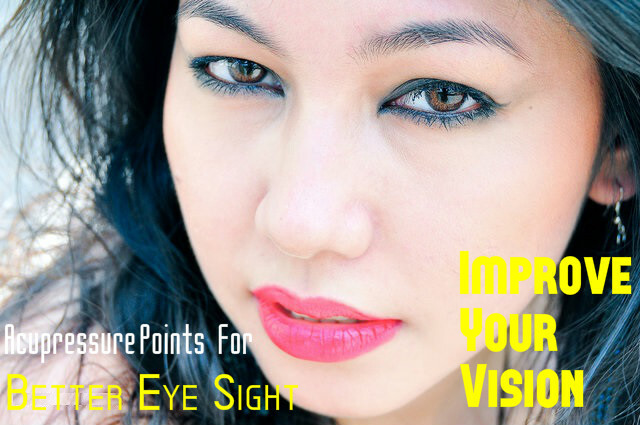 You can also improve your vision by pressing these points regularly. Put your index fingers on either side of the nostrils and then massage slowly. This is very effective for getting your relief from the pains caused as a result of sinusitis. You also get relief from headaches and nasal congestion with regular massage. It is also good for improving your eyesight. When you do this, apply gentle pressure on the nostrils. Take care not to push too hard that it makes you breathe through your mouth. Repeat this daily for about five minutes to get the desired results. There are acupressure points on the bridge of your nose also and these are very effective for your eyes. Use both of your hands for this. Massage on either side of the bridge of your nose with your hands. When you massage the bridge of your nose, you have to remember to keep your fingers straight. Never bend your fingers. You can do this for 5 minutes to reduce the redness on your eyes and the strain felt on your eyes. Now you have to move on tom the centre of the T-zone of your forehead. This is also an acupressure point. Massage this point to get relief from stress and to improve your eyesight. There are acupressure points for your eyes on your fingertips and also on the tips of your toes. Bring your hands together so that the tips of your fingers touch each other. Now rub them together gently. To massage your toes, you have to hold each of your toe tips between your index finger and the thumb and massage each of it separately. This helps in increasing the circulation of blood all over the body and helps in improving your eyesight. There are many acupressure points around your eyes. You can massage them for various benefits. First of all you have to start with your inner edge of the eyes. It is an acupressure point that is seen just adjacent to the bridge of your nose. Use your middle fingers to massage here. Massage the point with small circular movements. You can continue massaging the point for about three minutes. There is another acupressure point that is situated on the outer edge of your eye close to the temples, and on the same horizontal line. Massages this point also in the same way as you did the inner point. Next acupressure point you can see right below the centre of your eye. The last acupressure point is present in the eyebrows and it is vertically above the pressure point below your eyes. By massaging these four pressure points daily, you can reduce the soreness that you feel in your eyes. It is also very effective for increasing your eyesight. If your eyes are very sensitive, take care not to apply any pressure on your eyes when you massage these points. People across the world are now looking for alternative medicine and a holistic approach to health. This has made acupuncture gain popularity all over the world. According to studies made by scientists, auricular acupressure is very effective for improving the visual acuity in patients suffering from glaucoma. Various studies are conducted on the possibility of acupressure for treating various health problems. You can also become an acupressure practitioner by going for accredited courses and getting a license. So try the acupressure techniques mentioned above and see how it benefits your eyes. This helps you get rid of various eye problems and provides you healthy eyes with better eyesight.